There is no school like home. That could actually be the entirety of this post, but I will expand on it and explain why. First, schools tend to send home hours and hours of nonsensical homework. Parents of and children attending school outside the home spend all day a part from each other, only to have family time between school and bedtime curtailed by homework. Homeschooling allows the parent to set the “school hours”, and because homeschooling is a way of life, even non- “school hours” are full of learning opportunities. Homework is not necessary. In Wyoming, standardized testing is not required for homeschoolers, therefore more time can be spent learning, rather than preparing for tests that are tied to teacher evaluations as well as school and district funding. *Some states do require one or two standardized tests a year for homeschoolers, but that is substantially less than public schools, that (in Wyoming) test an average of 5 times a year. Keep in mind that virtual public schools, like K-12 must comply with public school requirements, the homeschool statutes do not pertain to public school at home, and homeschool legal groups will not represent families that use virtual public schools/public school at home, for that reason. The bottom line is K-12 and Connections are NOT the same as homeschooling, they are public school at home with attendance and other requirements. Which brings me to flexibility. I pointed out when I brought up homework, that you get to set “school hours”. “School Hours” can be flexible to accommodate your family. Want to get into an orthodontist appointment at 9:00 a.m.? Start “school” after the appointment or even after lunch. And let’s talk about “school”… Every homeschooling family has a different approach to “schooling” (or in some cases “unschooling”, which isn’t the “four letter word” people think it is). Some use nothing but textbooks and workbooks, some use only boxed curriculum (Curriculum that comes with all subjects in a boxed set), some use only unit studies, some are reading/literature based, some view the world as their classroom, and some are a combination of different styles and methods. Guess what? There is no wrong way. I can tell you what works for my family, years of trial and error have led me to realize that flexibility is very important, because children are constantly changing. Think about how many times they change their favorite color or food… Homeschooling allows parents to adjust each child’s education as needed. I have linked to a “quiz” you can take to figure out which homeschooling style is most likely the best fit for your family, but keep in mind, not every child learns the same, so the ability to remain flexible is a must. When you first make the decision to homeschool, I suggest going to Currclick.com, and going through unit studies and/or lapbooks with each child. Allow them to choose a unit study based on their interests. This allows for both of you to de-school, and more importantly helps you watch each child learn, so you can see how they learn best. Interest based unit studies are a great jumping off point, because children retain more, thus learn more when they are interested. I also recommend that everyone, no matter their homeschooling style, read the writings of Charlotte Mason, you can find them here for free, or you can find them on Amazon.com. She truly understood children and education, even if you do not embrace her methods, I honestly think reading her writings will be beneficial to your homeschool. There are many reasons to homeschool besides the homework and testing, and those vary from family to family. The main thing to remember is this, each family has their values and beliefs. You don’t get to choose your children’s teachers, the people that will spend more time with your children during their waking hours 5 days a week for 9 months of the year than you. Teachers that spend so much time with your children that positive or negative can influence your child. The years pass by so fast, I started homeschooling the year my oldest started the 3rd grade. She will be 16 this fall, I am with her nearly all day every day, and somehow right before my eyes she grew up. It happens fast, even when you are homeschooling. Do not rob yourself of the precious years you have your children at home. Homeschooling allows you to watch your children learn and grow. You get to watch them develop into the person they will be. You get to be there for the struggles, and successes. (The best successes are the ones that come out of the struggles). 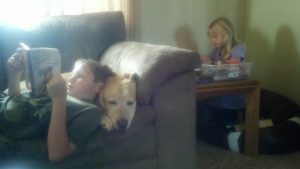 There are so many wonderful things about homeschooling, including the cuddles during reading time. 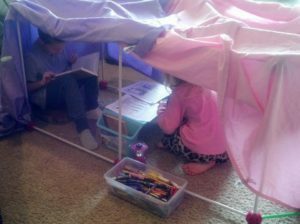 Homeschooling can take place anywhere, including a blanket fort, or the backyard. 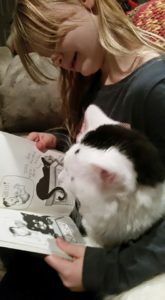 And bonus, pets love it when the kids snuggle up with them and read. There are as many reasons to homeschool as there are homeschooling families. And that is just another reason that makes homeschooling so wonderful, granted it can have its challenges, there will be bad days, but overall homeschool is wonderful and something you will never regret. Why homeschool? 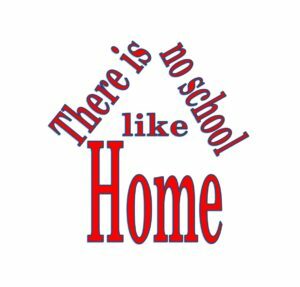 Because there really is no school like home. Be sure to check out these homeschool resources to help you get started.